As experienced sales professionals in the HR Outsourcing space ourselves, we know all too well that the months leading up to January, otherwise known as “selling season”, are critical to meeting end of year goals. HR Outsourcing vendors across the nation are kicking into high gear as sales teams strive to maximize this significant window of opportunity before a new year rolls around. [sws_pullquote_left]Looking to make sales? Go where the buyers are. [/sws_pullquote_left] According to a report in 2012 by Ernst & Young, the dog years are finally over for the HR sector. Firms of all sizes, who deferred purchases and reduced HR spending during the global economic downturn, are looking to reinvest in all sectors of the HR space. Incredibly, even during the global recession, the HR solutions industry clocked in consistent double-digit growth, growing 21 percent between FY08 and FY11. The report suggests that the sector could return to, or even outpace, the same year on year rate of growth that hit 34 percent in 2009. In other words, the next 10 years could be an era of prodigious growth and a period of unprecedented opportunity for HR vendors. HR sales teams across the nation are literally standing on the cusp of a potential surge of delayed purchases and a bevy of orders looking to get fulfilled before the January 1st deadline. For HR sales professionals and the HR solutions vendors whom they represent, the primary question they are asking themselves is: How can we best position ourselves to maximize our share of the pie? If you are an HR professional yourself, perhaps you are asking yourself the exact same question. Because large companies can be highly decentralized, HR purchases are typically made at all levels for a variety of ventures. In general, larger firms will make more purchases, as opposed to one or two for small firms. Generally speaking, bigger companies can usually afford benefit and training programs that may be financially infeasible for smaller businesses and will engage in broader strategic human resource management – much of which will require consulting with third party service providers or making essential purchases. While that doesn’t mean that small businesses should be neglected, by the numbers, targeting larger firms will typically yield better results and, ultimately, more sales in hand before the end of the year. 40 percent of HR buyers hail from five key states: California, Texas, New York, Illinois, and Pennsylvania. 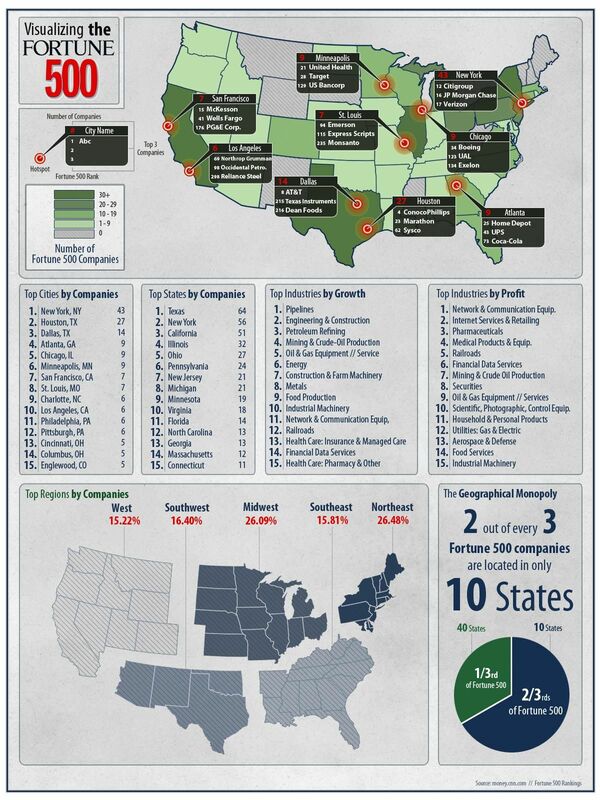 Unsurprisingly, these same states ranked within the top six for both population and for the number of Fortune 500 companies headquartered within their respective state boundaries. HR sales professionals aiming to close deals must establish a presence in those states – all which are called home by some of the world’s largest multinationals, which are also some of the most prolific buyers of HR services and products. Physical geographies aside, the HR software space continues to heat up as new digital geographies and market opportunities open up. Nearly two-thirds of multinational corporations have had their HRIS/HRMS for more than seven years and more than one in four are looking to replace their aging systems within 12 to 18 months. Meanwhile, as extant HR systems age, new technologies have dramatically restructured the digital HR landscape. Cloud-based service systems have become more accessible and easier to buy than ever. Mobile apps and other ways of improving the actual user experience have propelled a new generation of software into the forefront as HR buyers look for a better digital experience. Owners of previous iterations of software solutions especially, are making purchases that consolidate their many previously disparate systems. Forbes estimates that more than 450 million people around the world could license and use HR software. Yet with only 55 to 60 million seats sold to date, the market has a lot more room to grow. Looking to make sales? Go where the buyers are. For some, that may mean establishing themselves in new locales or in the growing digital space. Every HR buyer’s first step in their search for HR products and services is to turn to the internet. Therefore, it stands to reason that vendors and sales professionals who do not maintain an online presence will miss out on a massive channel of sales opportunities and business potential. In fact, HR Marketer reports that the internet has been and continues to be the HR buyer’s primary and most trusted choice for identifying vendors and services. HR buyers value industry content (e.g., white papers) and other organic online sources of information as a primary source of product/service information much more than ever before – more than print or online media advertising. Sites such as LinkedIn are by and far the most popular means of online networking amongst HR decision makers – 95 percent of whom use it for business purposes. Of course, one of the best game changing qualities of the internet is the ability to get a unified message across to a highly targeted audience of potential buyers. With a vast majority of HR buyers turning to the internet to seek guidance and to make purchases, the importance of maintaining a strong and favorable online presence with a high SEO score has become paramount. Most prospective buyers need to be exposed six or more times before they actually recognize a particular company brand, or product, and take actions that could result in a sale. The goal is to get your information in front of the RIGHT people, not the MOST people. It’s about quantity ANDquality. Sales professionals who can deliver the right message to the right people more times than the competition will, chances are, win the deal. Of course, saturating all relevant channels of communication will require an integrated approach to HR marketing encompassing all strategies, including but not limited to direct marketing pitches,SEO and online presence development, events and tradeshows, webinars, telemarketing, organic white papers, and other traditional modes of advertising. Persuading an HR or company executive to invest in your product or service requires a carefully crafted message and a finely tuned delivery. The end result of such an approach is multiple positive impressions on the buyer from several different fronts that deliver a unified message. Therefore, influencing the several tight-knit communities and organizations (content communities) that have an influence on the HR buyer is of paramount importance. In the world of HR, establishing a coalition through a champion within, or directly influencing, the target buyer is absolutely critical. Almost no business can occur without this point of contact and catalyst. Making a “first sale” with a generalist, specialist, director, or other first point of contact must often be made prior to actually closing a deal. These key individuals often operate only one or two levels away from vice presidents, senior vice presidents, and other HR decision makers who can actually make a purchase decision. Regardless, HR sales people must generate positive impressions at every level of the buying committee or coalition. Many employers seek to make HR related changes to current vendors or processes that will take effect in the upcoming calendar year, and essentially start fresh. This creates a pivotal window of opportunity that could make or break many HR sales services organizations. For sales professionals, this busy season will ultimately determine whether or not they succeed in meeting their quota, or fall short of key sales initiatives. Successful human capital drives better businesses. Perhaps you are a frustrated sales leader in search of the talented individuals who will push business demand and close out deals like pros. Or maybe you are a proven HR sales dynamo seeking your next career move. Centripetal Consulting has the experience, expertise, and human connections to meet all your HR consulting needs. Centripetal Consulting – We are the force that drives human capital. Amy Grimmer currently serves as President and CEO of Centripetal Consulting Group (CCG). Grimmer founded the company in 2007 with the concise mission to revolutionize the positive business impact that employers realize through HR Outsourcing. Both CCG clients and its HR services vendor network of HR look to Grimmer and CCG’s associates as a trusted, unbiased resource to understanding the complexity of HR Outsourcing. Grimmer’s vast knowledge of the HR Outsourcing space, CCG’s client focused approach, and the continued rapid growth in the HR Outsourcing industry are all contributing factors to the success of Centripetal Consulting Group. Prior to founding CCG, Amy Grimmer served the human resource outsourcing industry in a business development capacity. Her experience spans several functional HR practice areas including HR Outsourcing Strategy, Payroll/Tax Filing, HRIS and Benefits Administration, Health & Welfare Consulting, Retirement Plans, Workers Compensation, PEO/ASO Arrangements, HR Compliance, and Recruitment Process Outsourcing. Grimmer’s prior employers include Ceridian, ADP, Aerotek, Advantec, and RSM McGladrey Employer Services. Amy Grimmer exhibits extreme passion and dedication to the HR outsourcing industry and is an avid networker, author, and student of her profession. Amy has published several articles, whitepapers, and E-Books on various topics within the HR Outsourcing space. Amy is a graduate of the University of Missouri and holds a BA in Communications and a BA in English. She has completed coursework for her Masters of Business Administration in Human Resource Management at Lindenwood University.